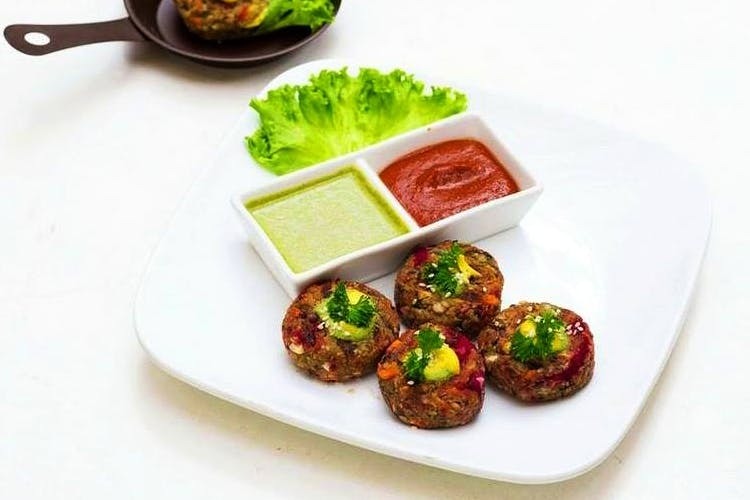 Vegetarians will rejoice at Sadashivanagar’s collection of meat-free restaurants and cafes. Some of these places take it a notch higher by serving vegan options as well. If you are a resident or working out of Sadashivanagar and fancy a Sattvic style buffet, Pasta Il Formaggi or even some Whole Wheat Pizza, here’s our pick of the best vegetarian eateries in the area. Vegetarians and anyone looking to eat right, the menu is a dream. With vegan, gluten-free, and lactose-free options, JustBe Cafe nails the inclusivity spot on. The Lentil and Falafel Roulade along with Beetroot & Spinach Multi-grain Nachos come highly recommended. If you are looking to keep things light, Beetroot Hummus with Veggie Stick & Multi-grain chips and Sprout Me Up (a salad with sprouts, guava and a tangy dressing) are our picks. Do try the Vegan Lasagna, we love it! To know more about their drinks and desserts, read here. It’s Sattvic style preparation of the food that makes Sattvam stand out. Mainly a buffet restaurant, you can load up on all kinds of greens and sugar-free dessert options such as Gajar Ka Halwa, Jalebi Rabri, and since it’s summer, Aamras. The buffet menu is a mix of Indian and Continental, expect to see pasta along with pulao. Pani puri stations, live roti counter, and that dessert counter overloaded with pastries and Indian sweets will see to it that you’ve got lunch or dinner sorted. And your tummy happy. Sattvam is part of our best vegetarian restaurants in Bangalore too. Find out if your favourite vegetarian restaurant is on the list here. Craving Chindian? Or some good old dal-roti-chawal? Pakwan is where you need to dine at. The restaurant is very fam-jam friendly, so if you are going with parents, order them a round of Sweet Corn Soup or Tomato-Coriander Soup. One by two as most fathers would want it! Masala Pappad and Aatish-E-Aloo (tandoori baby potatoes) is a must-try. For mains, there’s Paneer Makhanwala, Jalandhari Mushrooms, Dum Aloo Kalimirch, and Amritsari Rajma to be mopped up with some roti, kulcha or pulao. The all-vegetarian Italian menu with wood-fired pizzas, cheese-loaded pasta, and a long list of desserts is what Little Italy all about. Just like the other outlets across Bangalore, the Sadashivnagar one is packed during lunch and dinner. Probably need to reserve a table if you are going with a large group. Do try their Pasta Formaggi that comes with fresh tomato sauce on request and the Pasta Al Forno, where the pasta is baked in a creamy Bechamel sauce. Our favourites! If you are mad about pasta, you should know Little Italy is part of our best pasta in Bangalore list. Read about it here. We admit it’s not really a restaurant or a cafe, but more of a sweet spot, but it’s a rather popular hangout as we discovered. College kids, couples, and kids make up the patrons who visit the dessert place for their cookies, macrons, and pastries. They have eggless options too, so win-win! Pair your Red Velvet Cheesecake or Whiskey On The Chocs dessert jar with a Basil Paneer Potato Pizza and you are all set. Also, if you a sweet tooth person, you definitely need to check out our list of the best desserts spots in Bangalore here.